All Rackit shelves are made of heavy duty steel, rated at 35 to 375 lbs., and are designed to fit in any standard 4-post IT rack and 2-post telco/relay rack. 4-post-mounting shelves get mounted on all four corners, hence providing stability and high weight rating. Rated at 100 to 375 lbs., 4-post-mounting shelves are available with either a solid surface or a perforated one for extra equipment ventilation. 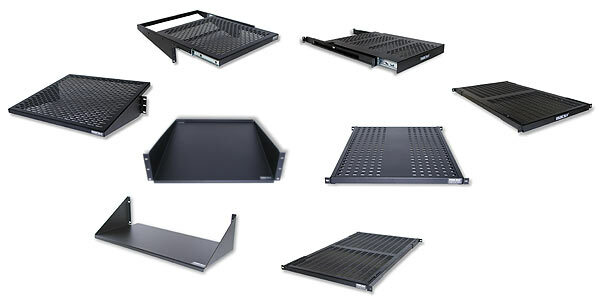 Rackit's 4-post-mounting shelves are compatible with any 4-post IT racks, server racks, equipment racks, enclosed cabinets, Servit™ open racks and some (depth-permitting) Wallit™ Swing-Out wall-mount racks. 2-post-mounting shelves – single-sided or double-sided – are designed for front-mounting of light-weight odds-and-ends IT gear and miscellaneous equipment in 2-post and 4-post IT racks. Rated at 35 to 150 lbs., 2-post-mounting shelves are available with either a solid surface or a perforated one for extra equipment ventilation. 2-post-mounting shelves are compatible with any 2-post and 4-post IT racks, as well as and wall-mount racks. Wallit™ CPU desktop/tower wall-mount brackets are designed to get the computer off the floor (or off the desktop), protecting the PC and createing a more functional, organized workspace.